In a large mixing bowl, combine washed and chopped methi leaves, onion, green chilli, flours, turmeric and red chilli powder, salt, 1 tbsp oil and mix well. Now slowly add water (little at a time) and knead a dough. Set it aside for 15 minutes. Then make medium potato size balls, roll a small round, using rolling pin and flour for dusting. Apply little oil or ghee and fold it into semi-circle. Then again apply some oil and fold into triangle. Dust with flour and start rolling. Now sprinkle some sesame seeds on the board and some on the top portion of the paratha, press with your fingers and roll into a paratha. Heat a griddle, grease with some oil, place the rolled paratha, put some oil from its sides. 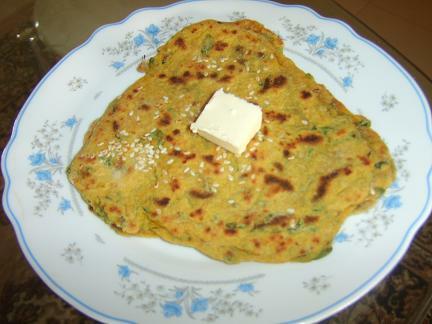 Let the paratha cook well from both sides similarly and then serve hot with yogurt, butter or ketchup.